This manuscript is named after Eadui Basan, one of the most accomplished scribes of the 11th century. He was a monk of Christ Church, Canterbury, and wrote a number of books apparently destined for other monasteries, as well as books and documents for his own. In addition to having some of the most beautiful handwriting of Anglo-Saxon England, he was probably also a skilled artist, responsible, for example, for the miniature in the present manuscript. This miniature which fills a page at the end of the Psalms shows St. Benedict, father of Benedictine monasticism, enthroned. 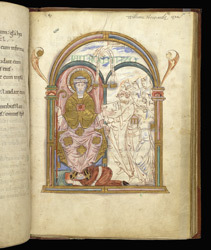 Above is the hand of God, to the right are monks of Canterbury, and at his feet the kneeling figure humbly holds an orange book labelled in Latin 'Book of Psalms' There is little doubt that this is Eadui's self-portrait.